It doesn’t matter what religion you are, or even if you’re an atheist, this is a painting I’d like to share with you. It is a part of my journey as a person and as an artist. Please enjoy, my friends! At first this painting appears to be “just“a still life, but I’d like you to look closer. “Then He took the bread and broke it saying, “Take, eat, for this is my body which is given for you; do this in remembrance of Me.” Likewise He took the cup saying, ” This is My blood of the new covenant, which is shed for you”. Close your eyes, picture yourself there at the table beside Jesus during those last dark, agonizing moments before He gave His life for you. Now look at this painting. The light rays from the ancient lamp remind us of the Star of Bethlehem that drew the searching souls of the Magi to Jesus when he was born, and likewise it draws your eye into this painting. Above that light, very faintly, we see a vision, or a flashback of the cross on which Jesus was crucified. I chose the wine glass to be the only modern element in the painting. I want us to remember His blood in this modern age when we so easily forget Him. 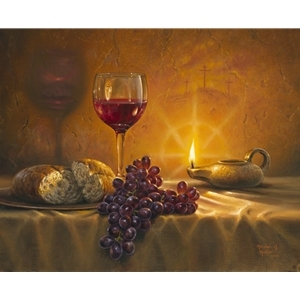 I added the grapes to give this somber and contemplative painting some joy, and bring to mind the day we will eat with Him again, “in His Father’s kingdom”. In this painting we remember His birth, His last supper with us, His death, and the future He has for those who love Him. If you look closely, you can see yours and Jesus’ reflection in the wine glass. You can see Him holding you, and hugging you tight as He can. He loves you and He wants you to come home. It has taken weeks for me to complete this painting. It’s been an adventure and it’s my new favorite. I hope Remember Me blesses you. .